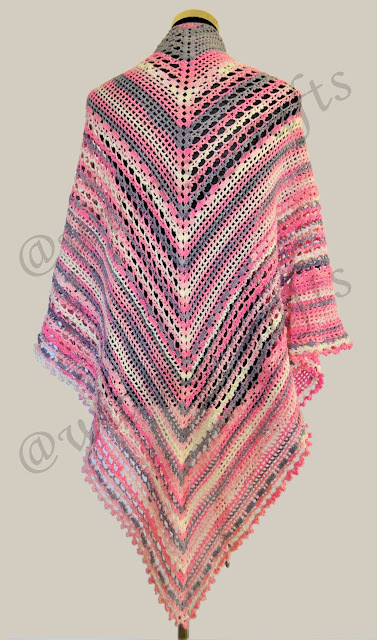 It is obvious at this point that I am a big shawl fan. Looking over all my previous shawl designs you can see that some are knitted, others are crocheted, some are mono or multi-colored, with the yarn weight used varying from chunky, bulky, and worsted to fine. 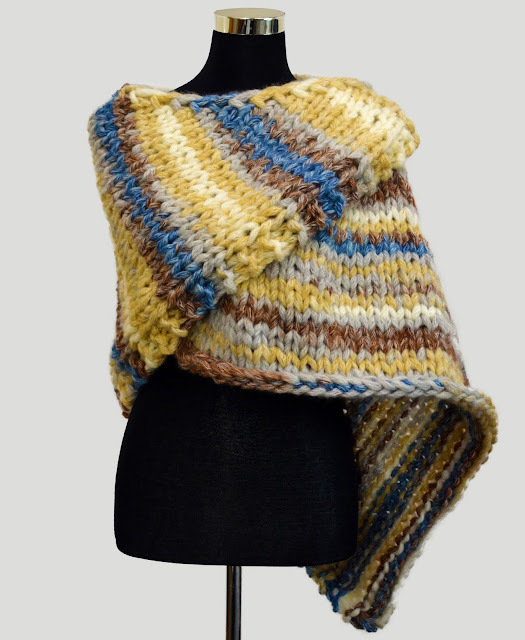 What makes this shawl different is that it has two sets of patterns that swap along its length. Using a multi-colored yarn had a nice effect, and I am quite satisfied with the finished product. This shawl can be made using one color of yarn, and still look gorgeous I am sure. And as always, you are free to ask me anything if you have trouble following the instructions. I look forward to seeing your finished works! Hi Friends! It's March! and I love this month that brings the first signs of spring, especially after a very long winter. My mind is swarming with ideas, but time cuts my work just like a sharp sword. 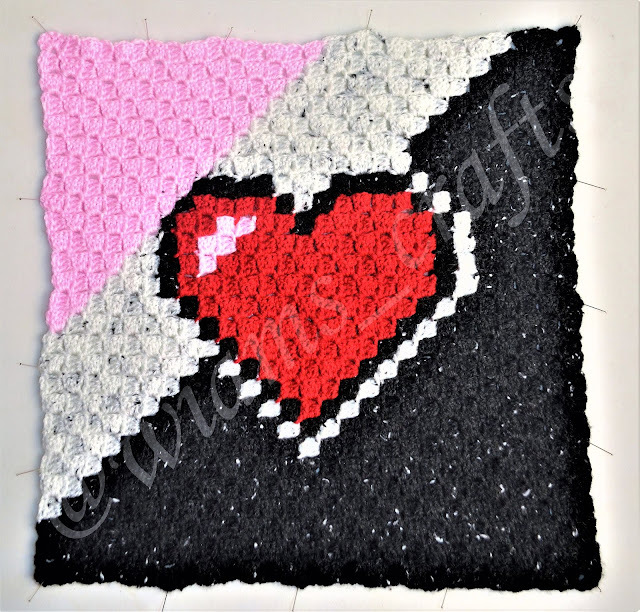 I like the C2C technique and the pixelated drawings, and from time to time I make a project inspired by it. And since I have boxes and boxes of scrap yarn in my rack (and on top of my wardrobe, basically, It taking over all the storage space in my house), I've designed and crocheted a cushion cover using some of these left-overs. I also came up with another version that can be worked as scarf ends, and another as a coaster. It's spring, the sun is shining, the green grass covers the terrain in front of my home and trees are blooming all around. 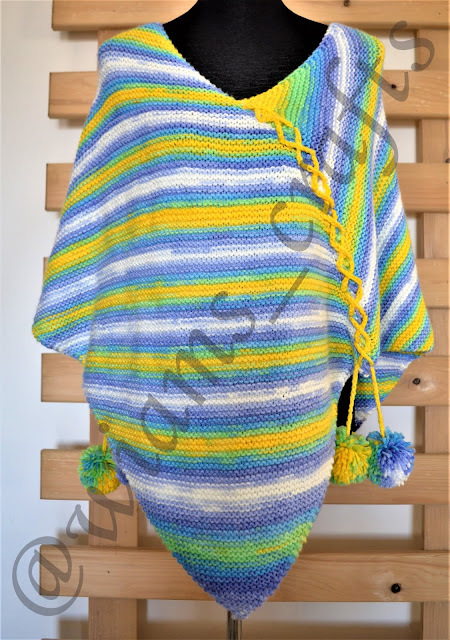 This inspired me to make this design, a poncho that has all spring colors; green, blue, yellow and white of course, to wear whenever it feels chilly be it day or night. 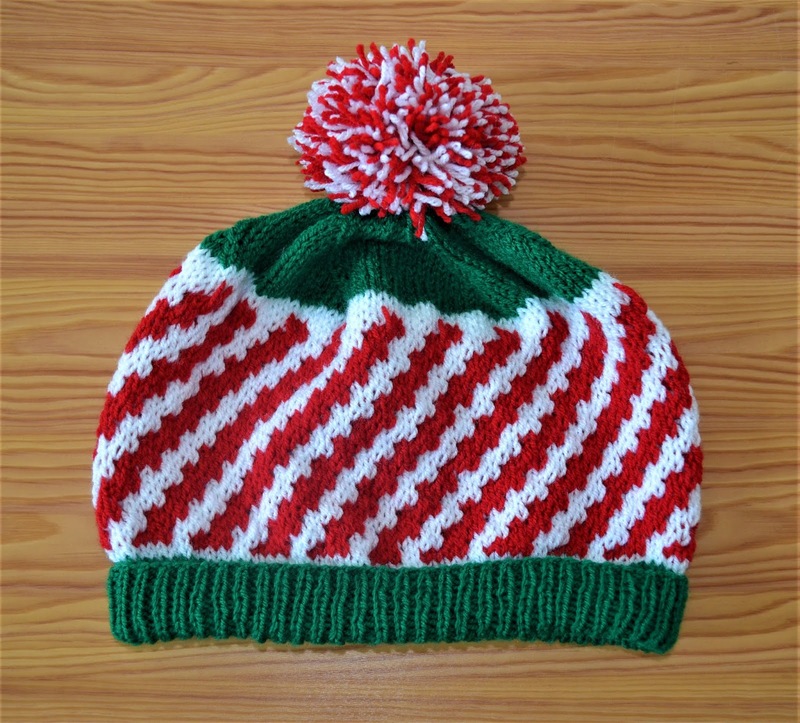 It's simple and could be knitted to fit any figure. Have a nice knitting day! I like spring, for I love the beginnings; of spring, the life circle for plants, animals and the pace towards long sunny days. 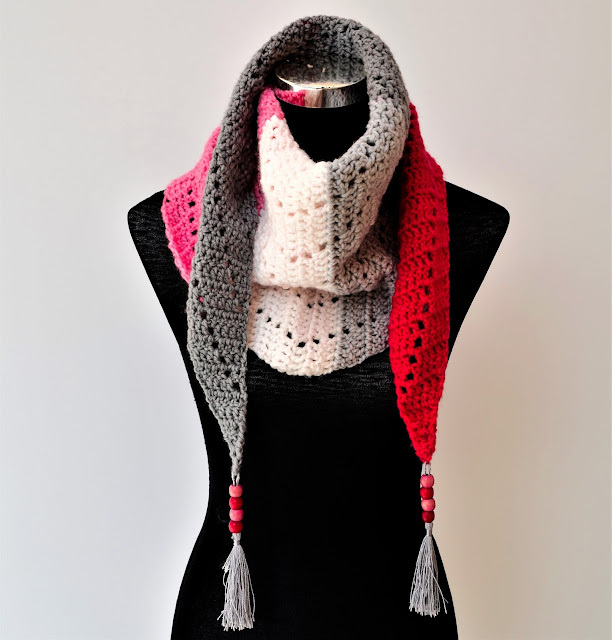 In march, at my home country we celebrate many; teachers, women, mothers and spring days, so my first project will be a shawl that has the lace motif heart pattern, which shows my love and appreciation to all women, to the blooming flowers of spring. I hope you all have the same feelings and share happiness with your beloved ones. Hello and welcome to my first post of the new year! 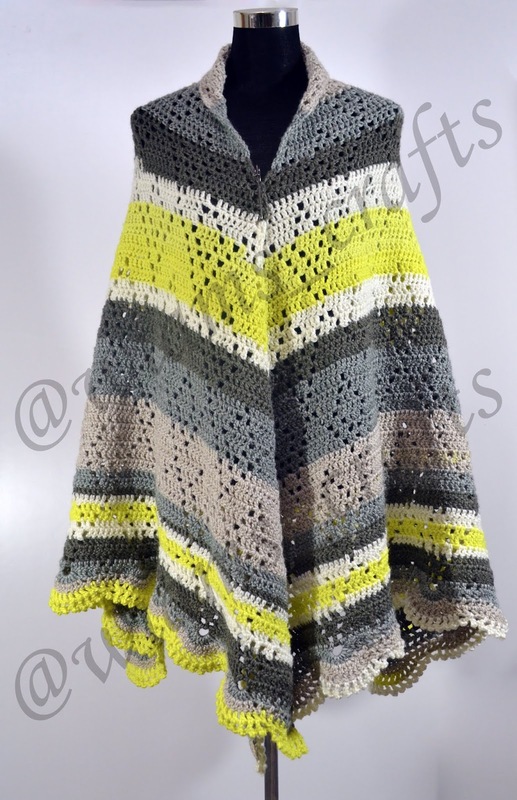 This project has been a long time coming, I started working on this poncho back in fall, but, as usual, I got busy with other stuff, fall turned into winter, and now spring is at the door. 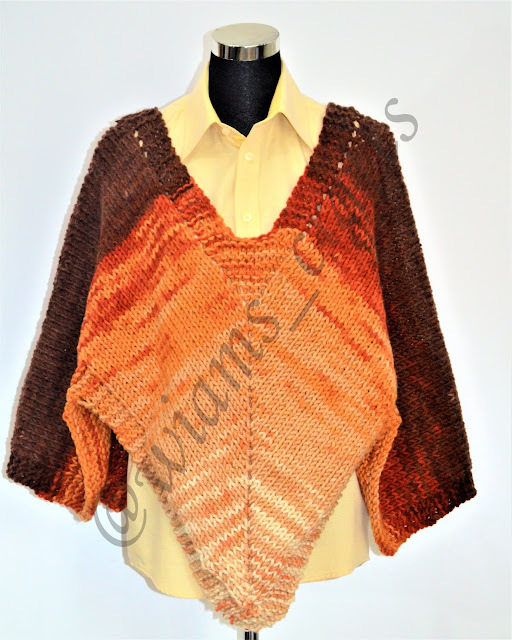 Nevertheless, here it is, a poncho the color of autumn leaves. If you choose to, you can work it using any ombre color gradient, or even any other bulky color combo yarn you like. I hope you enjoy making it. Have cozy knitting days! Hello friends! another year is about to wrap up. I had my ups and downs, but some of the best moments I've had were definitely the ones spent making crafts. 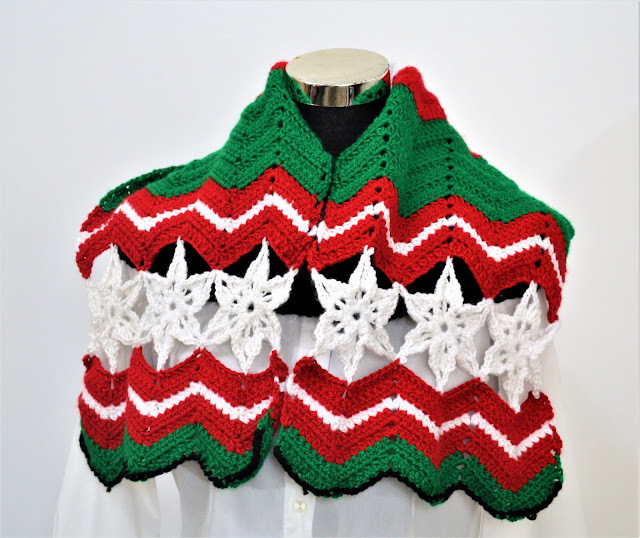 This is the last post for 2018, made with love and yarn that is 20% wool, very suitable for the winter, and it has some twists in its design; it's not the traditional triangle-shape, and it has a unique color combination. I am hoping 2019 will bring with it new Ideas, new yarn, more posts and more joyful times that alleviate the stress during bad days. I wish you all the same. Happy new year to you all! Hello friends! my new post is both simple and fun, the concept is inspired by Christmas sweets. I tried to make the design as simple and as quick to make as possible; you know the year is about to end, and this beanie would be perfect to make as a last minute gift. All other unfinished Christmas project ideas will be stored away for next year, until then, I hope you all have a wonderful new year! Hello friends and Merry Christmas! the holiday season is quickly approaching. I happen to quite enjoy this time of the year, with the gathering of family and loved ones, spending time with the little ones, and exchanging gifts. My first Christmas project this year is actually old. I've started making it in the summer, but then I forgot about it for months. I finally got to finishing it a week ago. It's simple to make, even if it doesn't seem so. Just follow the instructions and it should be a smooth sailing. Stay tuned for my next Christmas project, which will be posted hopefully soon. And if you are interested, the guys at yarncanada.ca are having their 2nd Annual event of giving yarn to individuals and groups who knit or crochet for good causes. In partnership with Bernat & Patons Yarn they are giving away $2000 worth of yarn and are hoping to get as many applicants as possible to ensure it goes to whoever it will have the maximum impact. Hello again friends! When I purchased the bulky Alize country yarn back in September, I wasn't aware it was not yarn. Turns out, it's a long cord made from something like mohair thread, and it can be knitted by hand, or very large sized needles. And since I didn't have a pair of knitting needles larger than 8 mm, I scored the local knitting and yarn shops for some large needles. 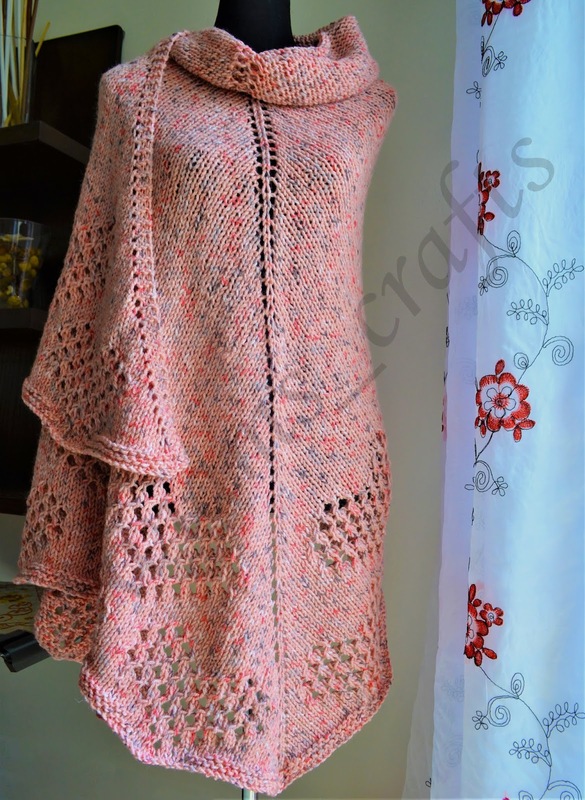 For me, I found that 20 mm needles or larger were the most suitable to work with this yarn. I experimented with not one, but three designs before I settled with the one I was most satisfied with for this kind of yarn, and the quantity I have. 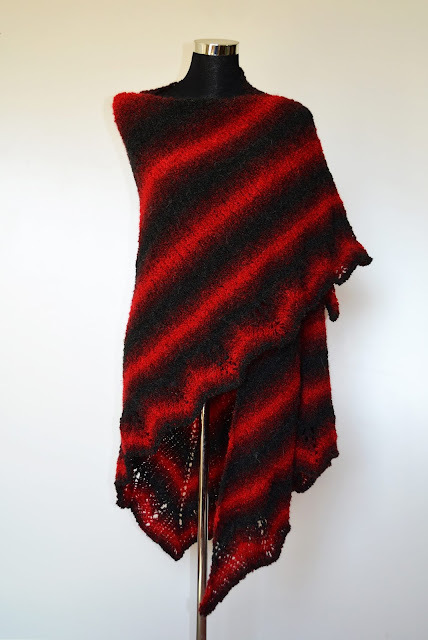 So here it is, a simple shawl, yet so warm and elegant. The color choices and sequence are vital factors in making it look cosy. By presenting this post, another 2018 resolution of mine has been achieved, which was making a project with bulky warm yarn. Hello friends! I've been knitting for a very, very long time, and I've worked with so many weights of yarn skeins; as small as 1.76 oz. / 50 grams and as large as 5.30 oz. / 150 gram. Last September, I went into a shop in Erbil's bazaar, and came upon a huge skein that weighs 12.32 oz. / 350 grams, with a rather nice gradient of red to black and back. I ended up buying it, even though I had no Idea what I would do with it at the time. I went back home and took a closer look at the skein's materials: wool and alpaca (there is acrylic and polyester too) and I thought to myself it would be great to make it into a shawl, suitable for a really cold winter evening event.